Colloidal Silver Water|Electrically Generated Silver Ions and Colloidal particles of Pure Silver, in Purified Water. MRSA, SARS, Avian flu, a few of the big-time bugs called "super-germs" that are making headlines on almost a daily basis. People are afraid, and rightly so. Super-germs can mutate so quickly that conventional antibiotics have become virtually useless against them. As soon as an effective antibiotic is created, the germ mutates and the antibiotic becomes obsolete. The same has been found to be true of many of the vaccines out there. But, there is no need to feel defenseless against them, because these mutating germs may have met their match with Colloidal Silver. Colloidal Silver is the next germ-fighting, a wonder drug. And not just for the serious threats, it is also effective against bacterial infections such as strep throat, viruses and fungal infections like Candida. The presence of Colloidal Silver near a virus, fungus, bacterium, or any other single-celled pathogen, disables its oxygen metabolism enzyme, its chemical lung, so to speak. Within a few minutes. the pathogen suffocates and dies, and is cleared out of the body by the immune, lymphatic, and elimination systems. Unlike pharmaceutical antibiotics, which destroy beneficial enzymes, Colloidal Silver leaves these tissue-cell enzymes intact, as they are radically different from the enzymes of primitive single-celled life. 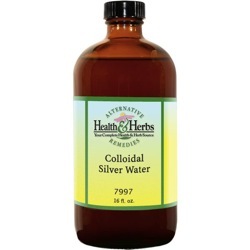 Colloidal Silver is absolutely safe for humans, animals, reptiles, plants and all multi-celled living matter. Colloidal Silver is the result of an electro-magnetic process that pulls microscopic particles from a larger piece of silver into a liquid, such as water. These microscopic particles can more easily penetrate and travel throughout the body. Colloidal Silver works as a catalyst, disabling the enzyme that all one-celled bacteria, fungi, and viruses use for their oxygen metabolism. In short, the bad guys suffocate. From 1900 to 1940, medical doctors in the U.S. used colloidal and other small particle silver preparations intravenously to cure otherwise fatal disease and infections. But then sulfa medications, penicillin, and other patented antibiotics were introduced and initially, they seemed to work like gangbusters against them. Since silver preparations are unpatentable, they fell into disuse and were even criticized as "old-fashioned" or ineffective by proponents of the patented medications. Some even claimed that a little bit of silver can be dangerous to your health. But, silver is a natural and normal part of our diets. Whole wheat and mushrooms are just two of the sources that contain relatively large amounts of silver. Unlike with antibiotics, resistant strains have never been known to develop with the use of Colloidal silver preparations. In fact, antibiotics are found to only be effective against perhaps a dozen forms of bacteria and fungi, but never viruses. Because no known disease-causing organism can live in the presence of even minute traces of the chemical element of metallic silver, Colloidal Silver is believed to be effective against more than 650 different disease-causing pathogens. Patented anti-fungal medications aren't working as well as they did at first either and the number of antiviral medications has always been small. Now, as we know, the situation is spiraling out of control. While Colloidal silver has been used as a preventative against viruses, bacteria, and fungus, it has also been applied directly to open wounds and sores to eliminate surface infections. Colloidal silver does not sting or burn, while other antiseptics do because they are killing the surrounding tissue as well as killing the germs. Colloidal silver, on the other hand, kills topical germs within six minutes, and it does not harm any surrounding tissue. In addition to fighting harmful germs and bacteria, Colloidal silver is an excellent remedy for treating acne breakouts. In addition to omitting the sugar, fats, and chocolate from the diet, any person with acne should wash and rinse the face thoroughly four times a day, and after rinsing, use a small amount of Colloidal silver, massaging it into the problem areas two to three times a day. This wash-rinse-massage activity may be continued throughout the acne breakouts, leaving the skin continuously clear. Eczema and skin rashes may also be helped with the use of Colloidal silver, by dabbing it onto the affected areas, rubbing slightly, repeating often and keeping the area moist with the preparation by using it with a bandage. Intestinal problems may also be helped with the use of this wonderful preparation. Put all or a fraction of the recommended daily amount into your beverage of choice accompanying any meal and as the food is digested, the presence of Colloidal silver will keep the food from putrefying in the digestive tract. This kills any germs present in food and leaves the food more usable for the body as well as, there will be no flatulence afterward. Parasites and their eggs cannot live and hatch when there is sufficient Colloidal silver in the surrounding body tissue. They are killed within a short time and subsequently eliminated by the immune system. Colloidal silver kills pathogens very quickly and this may cause the eliminatory organs, the liver, kidneys, skin, bowels, and lungs to be temporarily overloaded. This is especially true in the case of overcoming AIDS and HIV with Colloidal silver, as one may feel as though he or she has the flu. It is recommended to continue the silver regimen, although you should be drinking up to 4 liters of water a day, and take five or six grams of vitamin C and a high enema to prevent these effects. Ingredients: Filtered purified, distilled water. Contains excessive silver (less than ten parts per million of electrically generated silver ions and colloidal particles of pure silver in solution). No chemicals are used in the production of this product. Instructions: Drink one or more ounces for occasional use. May be applied directly to cuts, rashes, earaches, toothaches, and burns. Store in a cool, dark place. NEVER REFRIGERATE. Special Precautions & Warnings: Colloidal silver water is not to be used every day except as a gargle in the morning and should only be swallowed if there is any bacteria, fungus or virus, inflammation, or cold/flu is present. Keep out of reach of children.